We honor God by serving others. We share a responsibility to bring God's love to hurting people. We are a Christian Mission Outreach dedicated to showing people, through our actions and love, the life changing power of Jesus Christ. Financial donations are always needed and welcomed. For financial donations our PayPal address is: tom@cdymexico.com - If you desire to donate by check, please email cancunchristianfellowship@gmail.com or tom@carpediemyucatan.com . We will be happy to furnish deposit instructions through Carpe Diem Yucatan SA de CV, our corporate parent. Our Mission: We honor God by serving others. We share a responsibility to bring God's love to hurting people. We are a Christian Mission Outreach dedicated to showing people, through our actions and love, the life changing power of Jesus Christ. If you are in Cancun or the Riviera Maya and have clothing or commodity contributions for our children, please contact Cherilyn Martin (cherilynmartin@gmail.com). All items must be sorted and sized before delivery. Please strive to make sure all items offered are clean and serviceable. Please ask yourself this question: Would you allow your children to wear the clothes in public? For contributions through PayPal, our PayPal address is tom@cdymexico.com. Be sure to click the “PERSONAL Tab and then the GIFT Tab” on the instruction page. Renovation of the 4th and final community bathroom at Casa Hogar will be completed this week. The project is looking great, and when completed, will help improve the quality of life for our children. With the financial help of our church members and worldwide Christian Mission Partners, CCF Good Guys Henry, John and Gary were able to purchase and deliver a week’s supply of pork, molida especial, chicken, salchicha Vienna, sliced turkey, bacon, chorizo, queso Oaxaca, eggs, bread, buns, fruit and vegetables to our Christian home. Cancun Christian Fellowship purchases and delivers groceries to Casa Hogar para Ninos Esperanza every week. Our church has moved to the La Quinta Hotel Downtown and the new facility is working out great. The last several Sundays we have been blessed with great visitors and a full congregation of members. Yesterday came close to standing room only. The Children’s Bible Study class has also been filled to overflowing. Laurie is doing a great job as evidenced by the children’s excitement. Yesterday’s semiannual pizza luncheon was the best ever as was evidenced by record attendance. There was plenty of food and fellowship to go around and everyone had a great time. The pizza luncheons are a wonderful way for our Cancun Christian family, along with Mission Partners and visitors to feast, fellowship and enjoy the afternoon. The children’s Valentine party as Casa Hogar is scheduled for Wednesday afternoon, February 13th at 4:45. All Mission Partners are invited to attend and assist with the festivities. For additional information, contact Cherilyn at cherilynmartin@gmail.com. Our pre-church entertainment will feature Flip Pallot fly fishing for Pacific Tuna. This is a great presentation with plenty of action. Remember there is an OXXO next door to the hotel if you desire coffee, soft drinks or snacks while watching the show. The purpose of tithing, found in Deuteronomy 14:22-23 (NLT), is made clear: to “teach you always to love the Lord your God.” By practicing good tithing habits, scripture tells us we are showing God our desire to put him first in our lives. Laurie Lipp offers a Children’s Bible Study Class each Sunday for children ten and under. The class is held in the Salon Mar. For additional details, please contact Laurie before or after the service. She will be excited to talk to you. 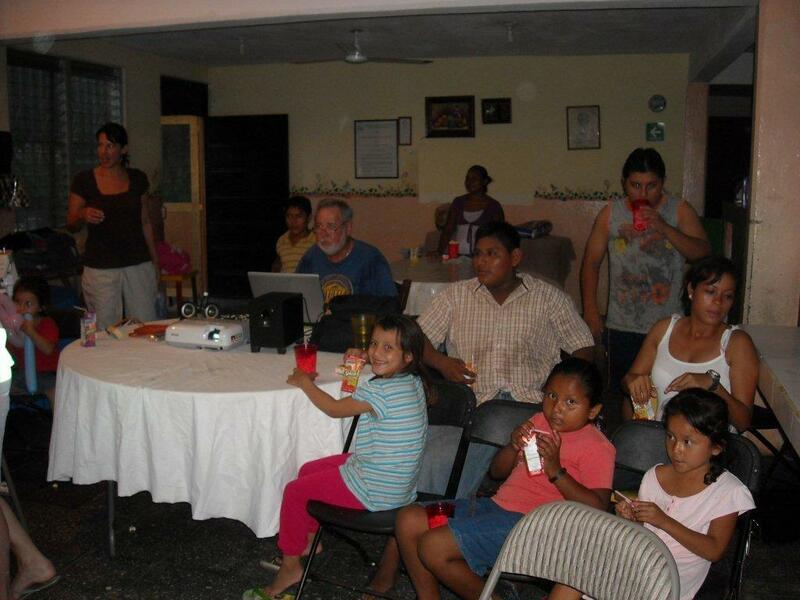 Katherine Phillips heads up our Building Spiritual Bridges Outreach with City of Joy Cancun. To assist Katherine, contact her at church or email her at kphillips99@hotmail.com. A Tuesday morning Men’s Group meets at the McDonalds at the intersection of Kabah and Nichupte. The group starts at 8:30 and usually lasts about an hour. Please contact Tom Martin at 998 121 1316 or tommartinmx@gmail.com for additional information. The Thursday Evening Christian Women’s Study Group meets at California Pizza Kitchen, Malecon las Americas, at 6:30 PM. For more information please contact Cherilyn Martin at 998-121-1315 or email her at cherilynmartin@gmail.com. Remember, Cancun's Christian Fellowship always meets at 10:00 AM SHARP at the La Quinta Hotel Downtown. That’s it for today neighbors…WE HOPE TO SEE YOU THIS SUNDAY!